Better fuel economy and lower emissions. The best spark plug hands down. Outperforms the stock spark plug. And any other NGK or Denzo spark plugs on the market. After installation the bike started up a lot smoother. If you doing a tune-up this is a must-have. Great price and a quality product. Have been using NGK for years and will continue. NGK reliability just stepped up a notch with Iridium Spark Plugs! Fits as expected. Started as expected. No problems thus far and I'm not expecting any! Very happy with this plug. A lot less expensive than if you bought it at the dealer. Also easier to get than having to go to a dealership, hoping that they have it in stock or to a local parts house, which won't have it. Worth the extra $5 to get the iridium spark plug. Lasts longer and burns cleaner. The only brand of sparkplugs our race team will use in our quads!!!!!!! Good plug to replace OEM plug. Can't go wrong with iridium. Fast shipping perfect fit great price. This is the recommended plug for the Trailblazer 250, so I tried it. In about 20 minutes of riding it blew a hole in the piston from preignition. This is the only change that I made and been riding the machine for years in deserts, mountains, hot and cold climates. Always use premium gas on 2 strokes and even with that it blew a hole in the piston. If you look at the standard plug you will see that the porcelain around the electrode is thicker than the iridium plug. If you want an iridium in a 2 stroke drop down a couple of heat ranges and maybe save your engine. They work fine for me in 4 strokes. Perfect fit and replacement for my 07 RMZ-250. Replaced the old worn out plug. Consistent performance is why I'll spend more for NGK plugs. Nice quality, katoom starts nice and easy ;) I have used iridium plugs on all my bikes. Can't go wrong here. Its a sparkplug what can you say, works as thought no issues. Got these for 2 stroke bike and I change them often. Burn well as long as your jetting is good. Great plugs! Last long and keep head cool. Price is not too bad for NGK. This spark plug does what it's supposed to do and nothing else. I got this a year ago and is still running strong. Installs like any other spark plug, and works better in my opinion. NGK Iridium plug 2010 KTM 450XCW Fantastic reliability! Solid performance upgrade! I replaced my plug on a 2010 KTM 450XCW jus this year. The bike has always started well, LI-Fe battery since 2016. However, I noticed it started to take more pushes of the button or more than one kick. I changed the plug, upgraded to NGK iridium series and HOLY WOW! One push starts and simple kicks. My old plug looked good too. Chocolate milk brown. I've got a 2006 RMZ450 and I have a new NGK iridium for that bike next! Great plug. Great starts. Better than stock always. 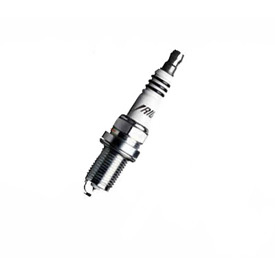 The NGK iridium sparkplug is a great product and much cheaper than the OEM plugs. I run this in my 86 TRX250R for a good spark and crisp throttle response. Very good spark plug. Worked great on my 2007 yfz450! I had to run iridium plugs on GSXR 1000, so ever since I've put them in my quads too. I run one in my YFZ 450 and just installed this one in my son's Outlaw 90. No complaints. Works good. First kick super plug, flipping amazing!!!! Unperralelled to any plug I've ever used, great buy. Sparks like a champ. Great plug for 4 strokes. Not something you want to cheap out on. When you need a quality spark, this works. Worked as they should. Only complaint was the packaging. For an item that can break easily or be damaged I figured a little more attention would be placed on packaging and shipping, especially when shipped with heavier items. Get the best to ensure you can ride. We spend a ton on our bikes, so don't skip on the plug. Good quality as always. Can’t go wrong with NGK. Run them in everything from my cars to my toys. Is as described. OEM match for my CRF450R. Item is as described. The OEM plug for my CRF450R. Always keep a spare with you! I purchased this as a part of my dual-sport repair/tool kit along with several other items from Rocky Mtn ATV. They are a great source for dual-sport parts & accessories!! Easy and cheap upgrade well worth the money. My 2006 Yamaha Rhion 660 was struggling at the top end. Replaced the spark plug with one of these gems and it runs like a champ all the way now! Easier to start and smoother idling too. I have been running these plugs in my Yamaha YZ250 for years. I have not had any issues with fouling out and they make my bike run great. I would recommend these plugs for there superior performance. I replace my plugs yearly and save the old one in my Klim Arsenal vest just in case. fair price. Happy trails to all. your sure this fits a 07 rmz450? Does the end screw off of this plug? This end want fit my wire. I need the end that is small with threads. BEST ANSWER: Been a while since I've bought this one but have used NGK for years and cannot remember one that did not screw off exposing the tip you need. Yes, had to take them ofF for both of my Yamahas. Yes it does. I have to do the same thing. Yes it unscrews and leaves a thread stud. Which are better overall these or the e3 plugs? BEST ANSWER: Without defaming a brand, in my opinion the solid brands from a overall reliability and performance point of view would be NGK, Denso, Bosch, I feel that some of the other brands are purely marketing. An example would be split fire, they guaranteed a performance increase but if you read the guarantee it voided if you dyno tested... lol so how do you quantify performance. I’d recommend sticking with ND or NGK for a bike. I have not used the e3 spark plugs. I have not had any problems with NGKs and will likely continue to use them. From my use the iridium are. They last a lot longer. The e3 I used didn’t make a good 7500 miles. I haven’t used E3’s. I have always stuck to NGK no matter what it’s for. Does this plug come with a terminal nut? BEST ANSWER: I don't believe it comes with a terminal nut. If I recall, it only comes with a threaded terminal stud with a terminal threaded onto it. No nut though. Is it a good idea to simply use the nut from the existing plug? Yes the spark came with a terminal nut already on it. Is this recommended for a 05 crf450r with a13:1 high compression piston installed? BEST ANSWER: This is a question for a professional performance engine builder. You will most likely need to adjust your heat range due to higher combustion temperatures. I use these in my 2 stroke for better resistance to fouling. is this plug direct fit for yz 125 1977? BEST ANSWER: Yes, this will fit your machine. To see if this part will fit your machine please enter the make, model, and year into our "Choose a vehicle" drop down boxes found above the product image. If your machine is not listed, we may not carry the right item for your application. If you have a 2017 year model but don't see your machine as an option, please contact a tech via Live Chat or call us at 1-800-336-5437 for assistance. On my 2019 yz125 spark plug is BR9EVX, but i dont see any on here,, can i use the BR9EIX,, is that the same but much pricey? BEST ANSWER: They are the same size plug just a different model number. Do you stock ngk SILMAR7A9S plugs? BEST ANSWER: Unfortunately, we do not carry this plug. I have a 2004 Honda trx 450r, if I have the bike registered and looking at parts for it yall will know what plug to send me for my bike? BEST ANSWER: Yes, just enter in your make, model, and year and it will give you the stock sparkplug. I need this plug for a 1999 KTM EXC 250 two stroke. Dont see it listed? BEST ANSWER: I looked into this for you and it looks like we only carry the Resistor Sparkplug for your machine. Will this plug fit 2017 polaris outlaw 110cc? Does this have to be gapped for a 2007 rmz 250? BEST ANSWER: These plugs come pre gapped.